It is difficult to trace the ancient history of the strawberry plant or strawberry tree, because there are so many different, complex, undefined species, and they have evolved in so many different places and countries. Pliny described the strawberry tree, Arbutus in his early writings of the Roman culture in the first century, AD. Strawberry trees, Cudrania tricuspidata, have been known since antiquity and have been so named because the berries growing on the trees resemble the familiar fruiting strawberry that grows on the ground. Some strawberry trees have a mideastern origin and others come from China. One strawberry tree of a substantial size was planted 200 years ago by early settlers at Sea Island, Georgia, and this tree reliably produces abundant crops every year. Strawberry trees are easy to grow and are thorny until the thick bark develops and sloughs off the thorns. The large fruiting strawberry tree increases in yield and fruit size each year, and the berries begin ripening in July and continue developing and growing into the fall. The mature strawberry tree, Che, can grow to 30 feet tall. The strawberry tree transplants best when dormant, and large trees sometimes produce strawberries the first year. The exotic strawberry tree is sometimes called the Che tree from China. Not only is the strawberry from these trees delicious, but it is also fragrant, attractive red in color, and as large as a half-dollar, with a flavor somewhere between a fig and a strawberry. Another type of strawberry tree is Arbutus unedo that only grows half the size of the Che tree. Pliny described the ground strawberry as a natural berry growing in Rome in the first century AD. Many Europeans were afraid to eat berries growing and touching the ground, fearing that they might be polluted by snakes, rats, and other wildlife animals. The strawberry can be seen in religious paintings of the 1400's. 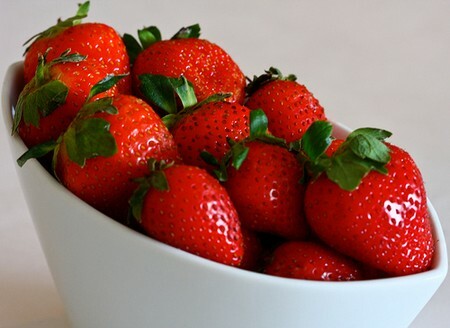 The strawberry fruit was pictured in paintings, because of its pure red color and graceful shape. The strawberry plants were being cultivated in Europe during the 1300's, but never in commercial quantities. Records in England show that King Henry the 8th purchased strawberries for eating in 1530. The Virginia strawberry, Fragaria virginiana, a wild species was exported from the United States colony in the 1600's to England, where it was favorable in taste, quality, size, and yields over the native European strawberry. After these two types of strawberry plants were planted in close proximity to each other, natural hybrids began to grow and substantial improvements were the foundation of the development of the modern day commercial strawberry industry. William Bartram noted several discoveries of strawberries in his famous early botanical book, Travels, in 1773 stating: "gliding swiftly between the fruitful strawberry banks," page 328, " a gentle breeze continually wafted from the fragrant strawberry fields, and aromatic Calycanthean groves on the surrounding heights," page 329. "The meadows presented for my acceptance, the fragrant red strawberry, in painted beds of many beds surface, indeed I may say, many hundreds," page 342. Bartram states that he visited a company of Indian girls "having baskets of strawberries" and a very agreeable good woman treated us with cream and strawberries," page 347. Dr. George Darrow of Cornell University and the New York Agricultural Station worked with strawberry plants for half a century and was instrumental in developed higher yielding strawberry plants in larger fruited berries with a better flavored strawberry and resistant to diseases. Strawberry plants are grown by many backyard gardeners, but commercial production comes from strawberry plantings in Florida fields in winter and from California fields in the fall. The commercial production and growing of strawberries has become very complicated, because of virus presence in some non-certified strawberry plants. To grow the strawberry at a home garden, a grower should begin with buying and planting certified strawberry plants. To obtain certification, a buyer of strawberry plants must purchase the plants that were grown from foundation plant stock grown for one year and freed from virus growth by growing in tissue culture for a period and applying virus indexing that is enforced by the Federal and State governments. Strawberry plants, Fragaria x ananassa, are grown commercially on sterilized soil using the fumigant, methyl bromide, or other chemical soil treatments. Strawberry plants must be replaced after a few years, since the strawberry plant clones decline each year. These worn out plants can be replaced with new, certified strawberry plants. The mother plants can be planted when dormant, and the center (crown) will develop daughter plants that spread to form mounds by stolons or runners. Cultivated strawberries, Fragaria x ananassa, yield heavily if fertilized and irrigated frequently. The roots of strawberry plants grow very shallowly and should be planted to grow in full sun, so that the berries will be sweet and large-fruited. 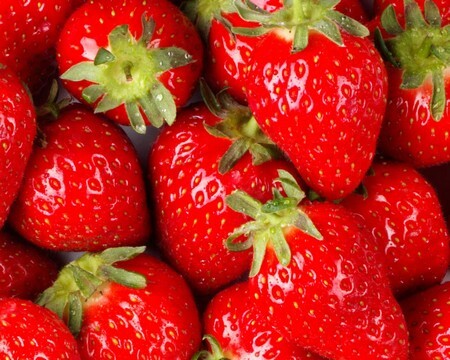 75% of strawberries are sold fresh and 25% are sold frozen. Strawberries are perishable, but can be held at stores at 32 degrees Fahrenheit for 5 to 7 days.